Happy New Year! Cheers! 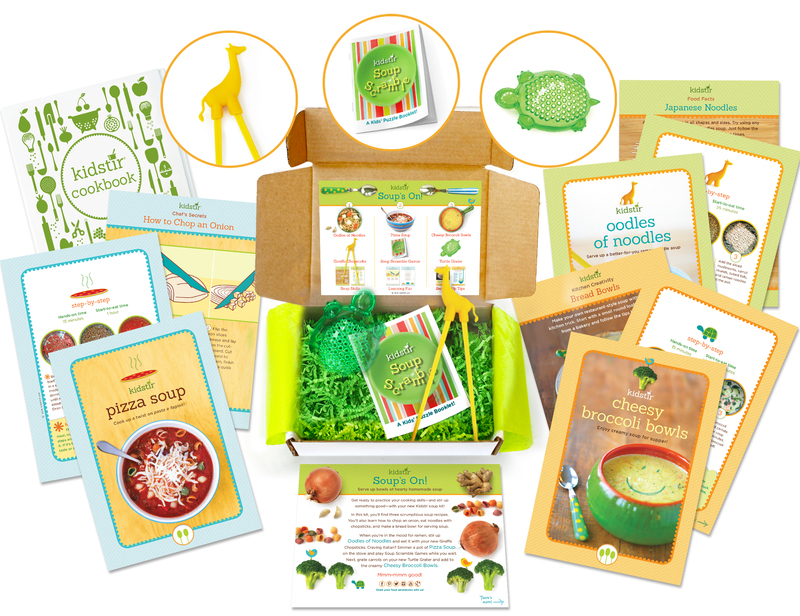 I’m so excited to introduce our January Kids Soup’s On Kit! If you’re feeling motivated by New Year’s resolutions to get the family healthy and eating well this year, there’s no better way to do it than with this tasty kit that’s also balanced with great nutrition (veggies, legumes, protein!) 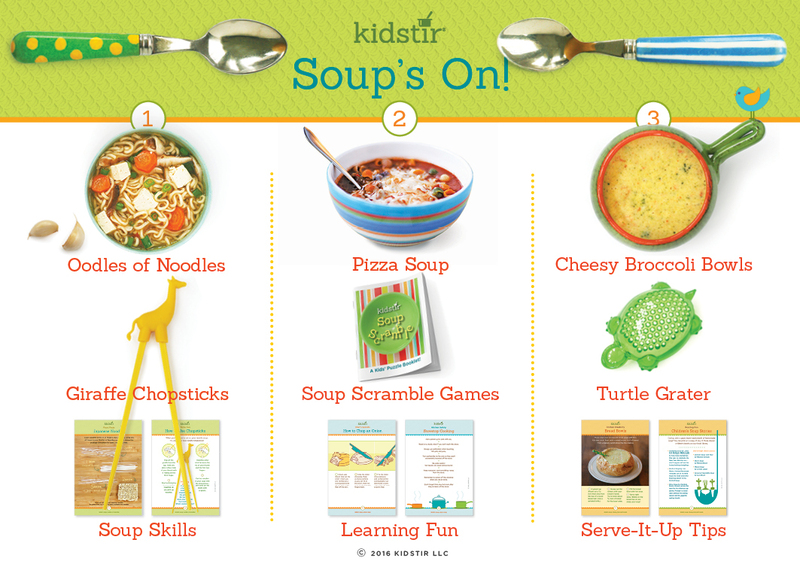 Start off by reading this primer on Making Soup with Kids and you’ll be ready to stir up some hearty, delicious soups! Oodles of Noodles These days, it seems ramen is IT. Everyone is going to the Japanese ramen noodle shops and trying all sorts of creative chef created soups. The fresh ingredients and flavors are tremendous. Now, many of my personal experiences with ramen are far from gourmet- I can think of a lot of Cup O Noodles consumed during my college dorm days. But when we know better, we must do better, so let’s get this right for our kiddos! There is a way to make authentic ramen at home that is healthy, clean, delicious and kid friendly and fun. This is the recipe to do that, without requiring any trips to the gourmet or specialty store! Pizza Soup About once a week, one my sons requests Pizza Soup! This soup, inspired by pasta e fagipoli, has become a year round staple in my home. It is hearty, tasty, nutritious and so simple to make. I make a huge batch and use it for days on end. Beans, ground meat (the recipe calls for ground beef but I usually substitute ground turkey), pasta, tomato sauce, yummy spices make for a filling meal. My son loves it so much that I’m thinking of picking up a thermos to send it with him for school lunch. I guarantee that despite the eye roll that might come with the name, it will be a hit for all in the family. Cheesy Broccoli Bowls What can I say, cheese lovers. This one’s for you! This soup is just beautiful when served in a bread bowl, a real show stopper for the winter months. Light up the fireplace and simmer this soup while the household is buzzing. The kids will enjoy making it, serving it, and of course, eating it. Plus, who isn’t looking for a way to add more green veggies to your diet in January. Enjoy! Here are the great tools that come with this kit! Giraffe Chopsticks These are adorable!!! I can’t even describe how much your kids are going to enjoy these eco-friendly, reusable, washable chopsticks because of their cute little topper shaped like a ….giraffe! What’s clever about these chopsticks are that without the topper, they can be used properly (and we provide great instructions for that in our foodie pages). But, when the kids are just starting, sometimes it’s okay to have a little crutch. So let them use the topper, and they’ll love feeling like they’re using chopsticks like the grown-ups! Soup Scramble Games I love puzzles. And so do kids! So we’ve got a fun little puzzle book for your kids to work on while their soup’s simmering on the stove. Crosswords, word finds, jumbles, etc…go ahead and chase the boredom away! Here’s a puzzle printout to get started with, before your kit arrives. Or, check out our full collection of fun kids cooking games! Turtle Grater Grating is one of those tasks that is generally pretty easy for kids to do, especially when we’re talking about soft stuff like cheeses. But I do worry about a little one scraping off some skin if they get close to the blade at the end. This whimsical turtle grater is perfect because it’s made of safe, hard plastic (BPA free and FDA approved). Kids can grate away while improving their kitchen skills without you hovering over concerned about their safety. And when they’re ready to graduate to the giant sharp graters at home…well this cute little thing might just become the go-to anyways. Besides the yummy recipes, there’s tons of foodie learning in this month’s kit: How to Chop an Onion, Food History, Stovetop Safety, Japanese Noodles Food Facts, How to Use Chopsticks, Stock Secrets, What’s a Roux, Kitchen Creativity, and even a Children’s Soup Stories roundup. Plus, load up on the great ideas from our DIY page and you’ve got a January to remember. After a lot of wish lists and material items in December, it’s wonderful to spend January thinking about others, and we have a post on Kitchen Volunteering that will help your family do that. Check out our Crunchy Croutons and Buttery Biscuits to pair perfectly with all your homemade soups this month. And once your kids are hooked on soup, two more fast and easy recipes that the kids can make anytime: Seashell Soup and Creamy Tomato Soup. 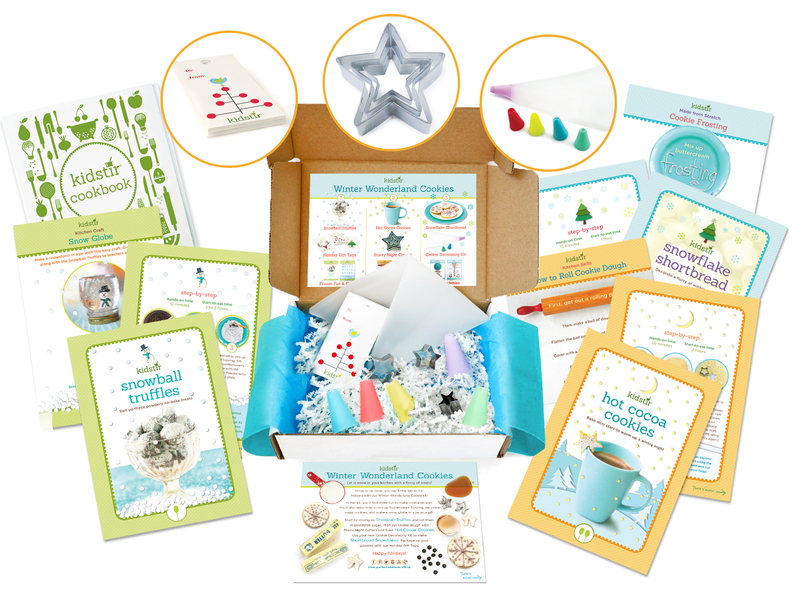 Finally, we know lots of your little ones got Kidstir kits as a Christmas present. If so, make sure you get their cookbooks set up right! Print out Kitchen Rules, Table of Contents, and All About Me pages to add to their cookbooks. If they didn’t get a Kidstir Cookbook Binder with their subscription, pick one up to organize all their recipes and foodie pages. Happy cooking… this month and the whole year long! Here’s to stirring up fun with Kidstir! Share your fun times, tips and tricks, and learnings with us on Facebook, Instagram, Pinterest, and Twitter. We love your photos!